The Somali people, also known as Somalis (Somali: Soomaaliyeed, Arabic: الصوماليون‎), are an amalgamated clans of ancient nomadic and warrior Cushitic Somali-speaking ethnolinguistic group inhabiting the Horn of Africa popularly known as Somali Peninsula. Somalis who are known for being the most homogeneous people in Africa and in the world are predominantly Sunni Muslims and they have mixed over the years with Arab settlers. They reside in Somalia, Ethiopia, Kenya and Djibouti. Ethnic Somalis population numbering over 18 million, with the larger concentration of over 8 million people living in Somali, over 4 million in Ethiopia, almost 1 million in Kenya and close to 500,000 in Djibouti; and with many also residing in parts of the Middle East, North America and Europe. The Somalis are ancient indigenous people who originated from a common ancestor, Irir Samaale (Irir Samali) who migrated from the highlands of Ethiopia and is probably of Ethiopian Cushitic Oromo ethnicity. Samaale is generally regarded as the source of the ethnonym Somali. It is believed that the nomadic Somali people existed in Ethiopia long before the prehistoric paintings on the cave of Laas Gaal in Somalia were ever made and that Irir Samale - possibly a nomadic man who came from a nomadic Ethiopian tribe - migrated to Somalia. Besides comprising the majority of the Y DNA in Somalis, the E1b1b1a (formerly E3b1a) haplogroup also makes up a significant proportion of the paternal DNA of Ethiopians, Sudanese, Egyptians, Berbers, North African Arabs, as well as many Mediterranean and Balkan Europeans. The M78 subclade of E1b1b is found in about 77% of Somali males,which, according to Cruciani et al. (2007), may represent the traces of an ancient migration into the Horn of Africa from Egypt/Libya. After haplogroup E1b1b, the second most frequently occurring Y DNA haplogroup among Somalis is the Eurasian haplogroup T (M70),which is found in slightly more than 10% of Somali males. Haplogroup T, like haplogroup E1b1b, is also typically found among populations of Northeast Africa, North Africa, the Near East and the Mediterranean. "Somali, as a representative East African population, seem to have experienced a detectable amount of Caucasoid maternal influence... the proportion m of Caucasoid lineages in the Somali is m = 0.46 [46%]... Our results agree with the hypothesis of a maternal influence of Caucasoid lineages in East Africa, although its contribution seems to be higher than previously reported in mtDNA studies." Somali people in the Horn of Africa are divided among different countries (Somalia, Djibouti, Ethiopia, and northeastern Kenya) that were artificially and some might say arbitrarily partitioned by the former imperial powers. Pan-Somalism is an ideology that advocates the unification of all ethnic Somalis once part of Somali empires such as the Ajuran Empire, the Adal Sultanate, the Gobroon Dynasty and the Dervish State under one flag and one nation. The Siad Barre regime actively promoted Pan-Somalism, which eventually led to the Ogaden War between Somalia on one side, and Ethiopia, Cuba and the Soviet Union on the other. In the United States, Minneapolis, Saint Paul, Columbus, San Diego, Seattle, Washington, D.C., Houston, Atlanta, Los Angeles, Portland, Denver, Nashville, Lewiston, Portland, Maine and Cedar Rapids have the largest Somali populations. Somalis now comprise one of the largest immigrant communities in the United Arab Emirates. Somali-owned businesses line the streets of Deira, the Dubai city centre, with only Iranians exporting more products from the city at large. Internet cafés, hotels, coffee shops, restaurants and import-export businesses are all testimony to the Somalis' entrepreneurial spirit. Star African Air is also one of three Somali-owned airlines which are based in Dubai. Besides their traditional areas of inhabitation in Greater Somalia, a Somali community mainly consisting of entrepreneurs, academics, and students also exists in Egypt. In addition, there is an historical Somali community in the general Sudan area. Primarily concentrated in the north and Khartoum, a geographical region where the local population exhibits strong cultural, physical and religious similarities with ethnic Somalis, the expatriate community mainly consists of students as well as some businesspeople. More recently, Somali entrepreneurs have established themselves in Kenya, investing over $1.5 billion in the Somali enclave of Eastleigh alone. In South Africa, Somali businesspeople also provide most of the retail trade in informal settlements around the Western Cape province. An Ancient Chinese document from the 9th century referred to the northern Somali coast — which was then called "Berbera" by Arab geographers in reference to the region's "Berber" (Cushitic) inhabitants — as Po-pa-li. The first clear written reference of the sobriquet Somali, however, dates back to the 15th century. During the wars between the Ifat Sultanate based at Zeila and the Solomonic Dynasty, the Abyssinian Emperor had one of his court officials compose a hymn celebrating a military victory over the Sultan of Ifat's eponymous troops. Ethnic Somalis speak Somali language known as Af-Soomaali, a branch of Cushitic language that belongs to the larger Afro-Asiatic language phylum. It is specifically a Lowland East Cushitic language along with its nearest relatives, the Afar and Saho languages. Somali is the best documented of the Cushitic languages, with academic studies of it dating from before 1900. Somali which is the second most widely spoken Cushitic language after Oromo, is spoken by over 19 million ethnic Somalis in Somalia, Djibouti, Ethiopia, Yemen and Kenya, and by the Somali diaspora. It is also spoken as an adoptive language by a few neighboring ethnic minority groups and individuals. Somali is also an official language of the Federal Republic of Somalia (95%), a national language in Djibouti (80%), and a working language in the Somali region of Ethiopia. The Somali language is regulated by the Regional Somali Language Academy, an intergovernmental institution established in June 2013 in Djibouti City by the governments of Djibouti, Somalia and Ethiopia. It is officially mandated with preserving the Somali language. As of 2013, Somali is also one of the featured languages available on Google Translate. Somali linguistic varieties are divided into three main groups: Northern, Benadir and Maay. Northern Somali (or Northern-Central Somali) forms the basis for Standard Somali, particularly the Mudug dialect of the northern Darod. It is today spoken in an area stretching from northern Somalia to parts of the eastern and southwestern sections of the country. This widespread modern distribution is a result of a long series of southward population movements over the past ten centuries from the Gulf of Aden littoral. Northern Somali has frequently been used by famous Somali poets as well as the political elite, and thus has the most prestige out of the Somali dialects. Benadir (also known as Coastal Somali) is spoken on the central Indian Ocean seaboard, including Mogadishu. It forms a relatively large group. The dialect is fairly mutually intelligible with Northern Somali. Maay is principally spoken by the Digil and Mirifle (Rahanweyn or Sab) clans in the southern regions of Somalia. Its speech area extends from the southwestern border with Ethiopia to a region close to the coastal strip between Mogadishu and Kismayo, including the city of Baidoa. Maay is not mutually comprehensible with Northern Somali or Benadir, and it differs considerably in sentence structure and phonology. It is also not generally used in education or media. However, Maay speakers often use Standard Somali as a lingua franca, which is learned via mass communications, internal migration and urbanization. The consonants /b d̪ q/ often weaken to /β ð ɣ/ intervocalically. The retroflex plosive /ɖ/ may have an implosive quality for some speakers, and intervocalically it can be realized as the flap /ɽ/. Some speakers produce /ħ/ with epiglottal trilling. /q/ is often epiglottalized. The language has five basic vowel sounds. Each possesses a front and back variation as well as long or short versions. This gives a distinct 20 pure vowel sounds. It also exhibits three tones: high, low and falling. The syllable structure of Somali is (C)V(C). Root morphemes usually have a mono- or di-syllabic structure. Archaeological excavations and research in Somalia uncovered ancient inscriptions in a distinct writing script. In an 1878 report to the Royal Geographical Society of Great Britain, scientist J.M. Hildebrandt noted upon visiting the area that "we know from ancient authors that these districts, at present so desert, were formerly populous and civilised[...] I also discovered ancient ruins and rock-inscriptions both in pictures and characters[...] These have hitherto not been deciphered." According to Somalia's Ministry of Information and National Guidance, this script represents the earliest written attestation of Somali. The Osmanya writing script for Somali. Since then a number of writing systems have been used for transcribing the language. Of these, the Somali Latin alphabet, officially adopted in 1972, is the most widely used. The script was developed by the Somali linguist Shire Jama Ahmed specifically for the Somali language, and uses all letters of the English Latin alphabet except p, v and z. There are no diacritics or other special characters except the use of the apostrophe for the glottal stop, which does not occur word-initially. There are three consonant digraphs: DH, KH and SH. Tone is not marked, and front and back vowels are not distinguished. Besides Ahmed's Latin script, other orthographies that have been used for centuries for writing Somali include the long-established Arabic script and Wadaad's writing. Indigenous writing systems developed in the twentieth century include the Osmanya, Borama and Kaddare scripts, which were invented by Osman Yusuf Kenadid, Sheikh Abdurahman Sheikh Nuur and Hussein Sheikh Ahmed Kaddare, respectively. Somali loanwords can be divided into those derived from other Afro-Asiatic languages (mainly Arabic), and those of Indo-European extraction. Somali's main lexical borrowings come from Arabic, and are estimated to constitute about 20% of the language's vocabulary. This is a legacy of the Somali people's extensive social, cultural, commercial and religious links and contacts with nearby populations in the Arabian peninsula. Arabic loanwords are most commonly used in religious, administrative and education-related speech (e.g. aamiin for "faith in God"), though they are also present in other areas (e.g. kubbad-da, "ball"). Soravia (1994) noted a total of 1,436 Arabic loanwords in Agostini a.o. 1985, a prominent 40,000-entry Somali dictionary. Most of the terms consisted of commonly used nouns. These lexical borrowings may have been more extensive in the past since a few words that Zaborski (1967:122) observed in the older literature were absent in Agostini's later work. In addition, the majority of personal names are derived from Arabic. The Somali language also contains a few Indo-European loanwords that were retained from the colonial period. Most of these lexical borrowings come from English and are used to describe new objects or concepts (e.g. televishen-ka, "television"; raadia-ha, "radio"). There are as well some Romance loans, such as garawati for "tie" (from the Italian cravatta), and bilyeti-ga for "ticket" (from the French billet). Additionally, Somali contains lexical terms from Persian, Urdu and Hindi that were acquired through historical trade with communities in the Near East and South Asia (e.g. khiyaar for cucumber, from the Persian khiyar). Some of these words were also borrowed indirectly via Arabic. As part of a broader governmental effort to ensure and safeguard the primacy of the Somali language, the past few decades has seen a push in Somalia toward replacement of loanwords in general with their Somali equivalents or neologisms. To this end, the Supreme Revolutionary Council during its tenure officially prohibited the borrowing and use of English and Italian terms. Is ka warran? Bal ka waran? Sideed tahay? Nabad miyaa? Ma nabad baa? My name is ... Magacaa? I'm from ... Xagee ayaad ka timid? Do you understand Miyaad fahantay? Please speak more slowly Tartiib u hadal! Do you speak English? Ingriis miyaad ku hadashaa? Yes, a little Af Soomaaliga maad ku hadashaa? How do you say ... in Somali? Maxaa af soomali lagu yiraahdaa ... ? How much is this? Meeqo waaye? Where's the toilet? Musqusha aawey? dance with me? Ma ciyaaraysaa? Call the police! Booliiska soo wac! Somalis are one of the ancient indigenous Cushitic people of Africa. Archaeological evidence suggests that the present-day occupants of Somalia had occupied the horn of Africa around the time of 100 A.D. The Somalis descend from a highly developed pastoral nomadic stock of a common ancestor known as Irir Samaale. The ancestors of the Somali people were an important link in the Horn of Africa connecting the region's commerce with the rest of the ancient world. Somali sailors and merchants were the main suppliers of frankincense, myrrh and spices, items which were considered valuable luxuries by the Ancient Egyptians, Phoenicians, Mycenaeans and Babylonians. Ancient rock paintings in Somalia which date back to 5000 years have been found in the northern part of the country, depicting early life in the territory. The most famous of these is the Laas Gaal complex, which contains some of the earliest known rock art on the African continent and features many elaborate pastoralist sketches of animal and human figures. In other places such as the northern Dhambalin region, a depiction of a man on a horse is postulated as being one of the earliest known examples of a mounted huntsman. According to most scholars, the ancient Land of Punt and its inhabitants formed part of the ethnogenesis of the Somali people. The ancient Puntites were a nation of people that had close relations with Pharaonic Egypt during the times of Pharaoh Sahure and Queen Hatshepsut. The pyramidal structures, temples and ancient houses of dressed stone littered around Somalia are said to date from this period. In the classical era, several ancient city-states such as Opone, Essina, Sarapion, Nikon, Malao, Damo and Mosylon near Cape Guardafui, which competed with the Sabaeans, Parthians and Axumites for the wealthy Indo-Greco-Roman trade, also flourished in Somalia. The birth of Islam on the opposite side of Somalia's Red Sea coast meant that Somali merchants, sailors and expatriates living in the Arabian Peninsula gradually came under the influence of the new religion through their converted Arab Muslim trading partners. With the migration of fleeing Muslim families(Arabs) from the Islamic world to Somalia in the early centuries of Islam and the peaceful conversion of the Somali population by Somali Muslim scholars in the following centuries, the ancient city-states eventually transformed into Islamic Mogadishu, Berbera, Zeila, Barawa and Merca, which were part of the Berberi civilization. The city of Mogadishu came to be known as the City of Islam, and controlled the East African gold trade for several centuries. So as it is Arab settlers (fleeing Arab Muslims) who came live along the Coast of East Africa, intermarrying the local people and having cultural influence in this region founded the current Somali ethnic group about 1200 A.D. At that time, it appears that the territory which is now the Republic of Somaliland, the former British Somaliland, was occupied primarily by the Oramo ethnic group. Nomads in Berbera, Somaliland, 1920s. The Ifat Sultanate, led by the Walashma dynasty with its capital at Zeila, ruled over parts of what is now eastern Ethiopia, Djibouti, and northern Somalia. The historian al-Umari records that Ifat was situated near the Red Sea coast, and states its size as 15 days travel by 20 days travel. Its army numbered 15,000 horsemen and 20,000 foot soldiers. Al-Umari also credits Ifat with seven "mother cities": Belqulzar, Kuljura, Shimi, Shewa, Adal, Jamme and Laboo. In the Middle Ages, several powerful Somali empires dominated the regional trade including the Ajuran Sultanate, which excelled in hydraulic engineering and fortress building, the Sultanate of Adal, whose general Ahmad ibn Ibrihim al-Ghazi (Ahmed Gurey) was the first commander to use cannon warfare on the continent during Adal's conquest of the Ethiopian Empire, and the Geledi sultanate, whose military dominance forced governors of the Omani empire north of the city of Lamu to pay tribute to the Somali Sultan Ahmed Yusuf. In the late 19th century, after the Berlin conference had ended, European empires sailed with their armies to the Horn of Africa. The imperial clouds wavering over Somalia alarmed the Dervish leader Muhammad Abdullah Hassan, who gathered Somali soldiers from across the Horn of Africa and began one of the longest anti-colonial wars ever. The Dervish State successfully repulsed the British empire four times and forced it to retreat to the coastal region. As a result of its successes against the British, the Dervish State received support from the Ottoman and German empires. The Turks also named Hassan Emir of the Somali nation, and the Germans promised to officially recognize any territories the Dervishes were to acquire. After a quarter of a century of holding the British at bay, the Dervishes were finally defeated in 1920, when Britain for the first time in Africa used airplanes to bomb the Dervish capital of Taleex. As a result of this bombardment, former Dervish territories were turned into a protectorate of Britain. Italy similarly faced the same opposition from Somali Sultans and armies and did not acquire full control of parts of modern Somalia until the Fascist era in late 1927. This occupation lasted till 1941 and was replaced by a British military administration. To the extent that Italy held the territory by UN mandate, the trusteeship provisions gave the Somalis the opportunity to gain experience in political education and self-government. These were advantages that British Somaliland, which was to be incorporated into the new Somali state, did not have. Although in the 1950s British colonial officials attempted, through various administrative development efforts, to make up for past neglect, the protectorate stagnated. The disparity between the two territories in economic development and political experience would cause serious difficulties when it came time to integrate the two parts. Meanwhile, in 1948, under pressure from their World War II allies and to the dismay of the Somalis, the British "returned" the Haud (an important Somali grazing area that was presumably 'protected' by British treaties with the Somalis in 1884 and 1886) and the Ogaden to Ethiopia, based on a treaty they signed in 1897 in which the British ceded Somali territory to the Ethiopian Emperor Menelik in exchange for his help against plundering by Somali clans. Britain included the proviso that the Somali nomads would retain their autonomy, but Ethiopia immediately claimed sovereignty over them. This prompted an unsuccessful bid by Britain in 1956 to buy back the Somali lands it had turned over. Britain also granted administration of the almost exclusively Somali-inhabited Northern Frontier District (NFD) to Kenyan nationalists despite an informal plebiscite demonstrating the overwhelming desire of the region's population to join the newly formed Somali Republic. A referendum was held in neighboring Djibouti (then known as French Somaliland) in 1958, on the eve of Somalia's independence in 1960, to decide whether or not to join the Somali Republic or to remain with France. The referendum turned out in favour of a continued association with France, largely due to a combined yes vote by the sizable Afar ethnic group and resident Europeans. There was also widespread vote rigging, with the French expelling thousands of Somalis before the referendum reached the polls. The majority of those who voted no were Somalis who were strongly in favour of joining a united Somalia, as had been proposed by Mahmoud Harbi, Vice President of the Government Council. Harbi was killed in a plane crash two years later. Djibouti finally gained its independence from France in 1977, and Hassan Gouled Aptidon, a Somali who had campaigned for a yes vote in the referendum of 1958, eventually wound up as Djibouti's first president (1977–1991). British Somaliland became independent on June 26, 1960 as the State of Somaliland, and the Trust Territory of Somalia (the former Italian Somaliland) followed suit five days later. On July 1, 1960, the two territories united to form the Somali Republic, albeit within boundaries drawn up by Italy and Britain. A government was formed by Abdullahi Issa and other members of the trusteeship and protectorate governments, with Haji Bashir Ismail Yusuf as President of the Somali National Assembly, Aden Abdullah Osman Daar as the President of the Somali Republic and Abdirashid Ali Shermarke as Prime Minister (later to become President from 1967 to 1969). On July 20, 1961 and through a popular referendum, the people of Somalia ratified a new constitution, which was first drafted in 1960. In 1967, Muhammad Haji Ibrahim Egal became Prime Minister, a position to which he was appointed by Shermarke. Egal would later become the President of the autonomous Somaliland region in northwestern Somalia. On October 15, 1969, while paying a visit to the northern town of Las Anod, Somalia's then President Abdirashid Ali Shermarke was shot dead by one of his own bodyguards. His assassination was quickly followed by a military coup d'état on October 21, 1969 (the day after his funeral), in which the Somali Army seized power without encountering armed opposition — essentially a bloodless takeover. The putsch was spearheaded by Major General Mohamed Siad Barre, who at the time commanded the army. Traditionally, Somalis were nomadic cattle herders and later some of them became fishermen. The majority of Somalis are working in the agricultural sector. Agriculture in Somaliland can be divided into three sub-sectors. The first is nomadic pastoralism, which is practiced outside the cultivation areas. This sector, focused on raising goats, sheep, camels, and cattle, has become increasingly market-oriented. The second sector is the traditional, chiefly subsistence, agriculture practiced by small farmers. This traditional sector takes two forms: rain-fed farming in the south and northwest, which raises sorghum, often with considerable head of livestock; and small irrigated farms along the rivers, which produce corn (maize), sesame, cowpeas, and—near towns—vegetables and fruits. The third sector consists of market-oriented farming on medium- and large-scale irrigated plantations along the lower Jubba and Shabeelle rivers. There the major crops are bananas, sugarcane, rice, cotton, vegetables, grapefruit, mangoes, and papayas. The acacia species of the thorny savanna in southern Somalia supply good timber and are the major source of charcoal, but charcoal production has long exceeded ecologically acceptable limits. More efficient and careful handling of frankincense, myrrh, and other resin-exuding trees could increase yields of aromatic gums. The industry that does exist is almost all small scale and produces products that are sold at local markets rather than exported overseas. In a lot of ways Somalia may well be a model for how to build an economy in a very poor third world country. The total lack of government involvement has proven beneficial in a number of ways. The ethnic Somali’s small fishing sector revolves around the catch and canning of tunny (tuna) and mackerel in the north. Sharks are often caught and sold dried by artisanal inshore fishers. In southern Somalia choice fish and shellfish are processed for export. In the early 21st century, Somalia’s fishing industry was affected by climate change, overfishing, and increasing incidents of piracy along the coasts. The bulk of Somalia foreign exchange comes in the form of remittances from Somalis working abroad, mainly in Middle East. Again this is quite an accomplishment given that there are no banks in the country. An informal banking sector has sprung up to handle these transactions. The Somalis have proven to be remarkably resilient. In precolonial times, land claims were made by families and through bargaining among clan members. During European colonization, Italians established plantations in the riverine area and settled many poor Italian families on the land to raise crops. Since independence much of this land has been farmed by Somalis. Somali nomads consider pastureland available to all, but if a family digs a water well, it is considered their possession. Under Siad Barre's socialist regime there was an effort to lease privately owned land to government cooperatives, but Somalis resented working land they did not own. Some land was sold in urban areas, but grazing land continued to be shared. Division of Labor by Gender. In traditional Samaal clans, men and older boys do the important work of tending camels and cattle, the most valuable animals. Girls and young boys tend sheep and goats. Somali men are considered warriors ( waranle ), except for those few who choose the religious life. Adult men are also expected to serve on their clan-family council. Urban men may work as businessmen, blacksmiths, craftsmen, fishermen, or factory workers. Women in nomadic clans are responsible for caring for children, cooking, and moving the family aqal. Women and girls in farming clans are responsible for planting and harvesting crops, caring for children, and cooking. Urban women may hold jobs in shops or offices or may run their own business. The Relative Status of Women and Men. Somali women are expected to submit to men and to fulfill their duties as daughters, wives, and mothers. Although they do not wear the Muslim veil, they generally do not socialize with men in public places. 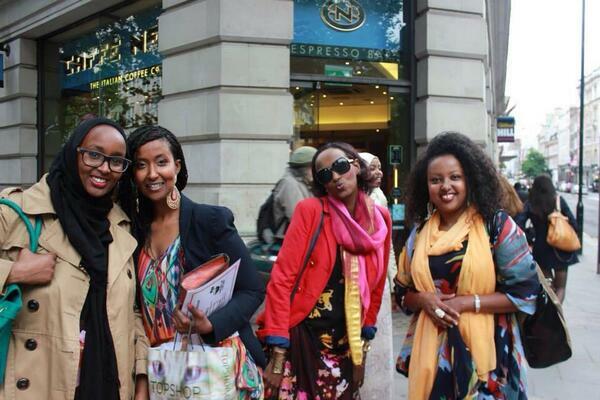 Somali women living in the cities, especially those educated in other countries, dress and behave more like Western women. Given the right to vote in newly independent Somalia, women began to take an active interest in politics and served on government committees and the People's Assembly. They served in military units and played sports. Opportunities for secondary and higher education had increased for women before the collapse of the government in 1991. Clan and family structure: The clan groupings of the Somali people are important social units, and clan membership plays a central part in Somali culture and politics. Clans are patrilineal and are divided into sub-clans and sub-sub-clans, resulting in extended families. 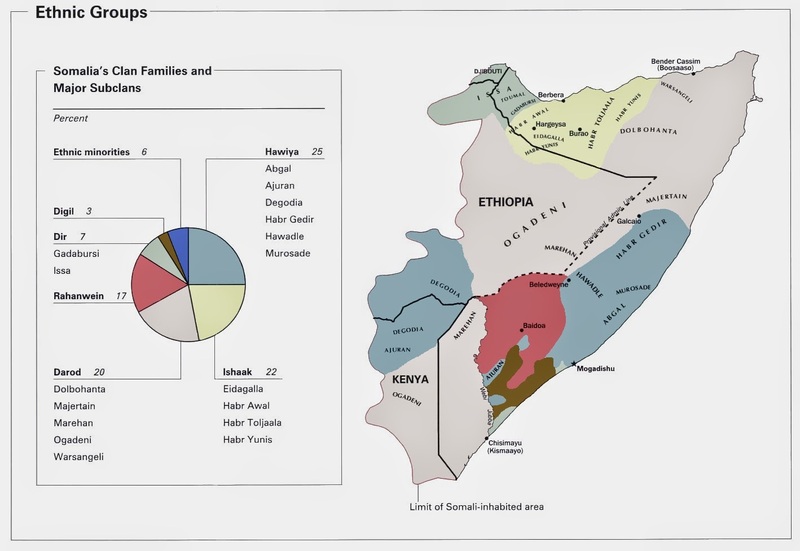 2002 CIA map shows the distribution of the various Somali clans. They are family trees of male descendants, that generally do not consider the roles of women, unless a man has more than one wife and there is a distinction between his sons by different wives. However, this does not mean that women have no importance in such male hierarchies. Rather, there are subtle roles for women, that differ in the clan structures from one ethnic group to another ethnic group. Among the Somali clans, a man is free to marry a member of his own clan or sub-clan, a member of any other clan or sub-clan, or a non-Somali. As Muslims, Somali men are allowed to be married up to a maximum of 4 wives at one time, but economic conditions seldom allow them to have more than 1 or 2 wives at one time. When a man dies, a brother sometimes marries the widow as a part of assuring social security within the extended family. Intermarriage among clans and subclans also has important political functions. When a small group from one clan moves into a territory dominated by another clan, it is prudent for their men to marry women from the larger clan, and vice versa, in order achieve peaceful relations. The importance of a given clan or subclan depends more upon the size of the clan or subclan and its wealth, usually measured by the number of animals that it owns, rather than the age of the clan or position of the founding father in the Somali family hierarchy. Small clans may effectively merge with larger clans for survival and small clans also often live for long periods of time interspersed within a larger clan, as if they were members of that clan. "Somali society is traditionally ethnically endogamous. 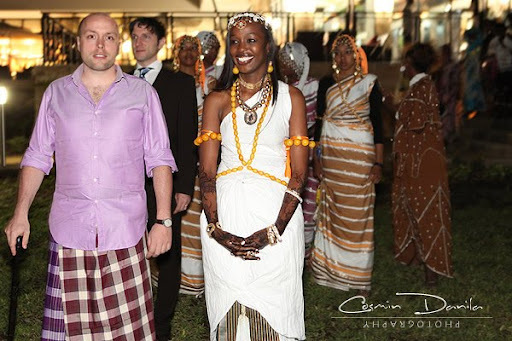 So to extend ties of alliance, marriage is often to another ethnic Somali from a different clan. Thus, for example, a recent study observed that in 89 marriages contracted by men of the Dhulbahante clan, 55 (62%) were with women of Dhulbahante sub-clans other than those of their husbands; 30 (33.7%) were with women of surrounding clans of other clan families (Isaaq, 28; Hawiye, 3); and 3 (4.3%) were with women of other clans of the Darod clan family (Majeerteen 2, Ogaden 1)"
Classes and Castes. The Samaal (Zumali) believe that their clan-family is superior to the Saab. The Saab clan-family developed a caste system that awards status to different groups based on their heritage or occupation. Lower-class groups among the Digil and Rahanwayn were identified by occupation. The largest group was the midgaan (a derogatory name), who served as barbers, circumcisers, and hunters. The Tumaal were blacksmiths and metalworkers. The Yibir served as fortune-tellers and makers of protective amulets and charms. In the late twentieth century, many from these groups found work in towns and cities and raised their status, and the old arrangements whereby they served certain clans had largely disappeared by the 1990s. The father of this clan is named Abdirahman bin Isma'il al-Jabarti, but is more commonly known as Darod. In the Somali language, the word Daarood means "an enclosed compound," a conflation of the two words daar (compound) and ood (place enclosed by wall, trees, woods, fence, etc.). According to early Islamic books and Somali tradition, Muhammad ibn Aqil's descendant Abdirahman bin Isma'il al-Jabarti (Darod), a son of the Sufi Sheikh Isma'il al-Jabarti of the Qadiriyyah order, fled his homeland in the Arabian Peninsula after an argument with his uncle. During the 10th or 11th century CE. Abdirahman is believed to have then settled in northern Somalia just across the Red Sea and married Dobira, the daughter of Dagale (Dikalla), the Dir clan chief. This union is said to have given rise to the Darod clan family. An official military survey conducted during the colonial period notes that Dir is in turn held to be the great grand-son of Ram Nag, an Arab migrant who landed in Zeila on the northwestern Somali coast. According to the British anthropologist and Somali Studies veteran I.M. Lewis, while the traditions of descent from noble Arab families related to the Prophet are most probably expressions of the importance of Islam in Somali society, "there is a strong historically valid component in these legends which, in the case of the Darod, is confirmed in the current practice of a Dir representative officiating at the ceremony of installation of the chief of the Darod family. There are also numerous existing hagiologies in Arabic which describe Sheikh Darod's travels, works and overall life in northern Somalia, as well as his movements in Arabia before his arrival. Besides historical sources such as Al-Masudi's Aqeeliyoon, a modern manaaqib (a collection of glorious deeds) printed in Cairo in 1945 by Sheikh Ahmad bin Hussen bin Mahammad titled Manaaqib as-Sheikh Ismaa'iil bin Ibraahiim al-Jabarti also discusses Sheikh Darod and his proposed father Isma'il al-Jabarti, the latter of whom is reportedly buried in Bab Siham in the Zabid District of western Yemen. Sheikh Darod's own tomb is in Haylaan, situated in the Hadaaftimo Mountains in northern Somalia, and is the scene of frequent pilgrimages. Sheikh Isaaq is buried nearby in Maydh, as is Sheikh Harti, a descendant of Sheikh Darod and the progenitor of the Harti Darod sub-clan, whose tomb lies in the ancient town of Qa’ableh. Sheikh Darod's mawlid (birthday) is also celebrated every Friday with a public reading of his manaaqib. The Darod were supporters of Imam Ahmad ibn Ibrahim al-Ghazi during his 16th century conquest of Abyssinia; especially the Harti, Marehan and Bartire sub-clans, who fought at Shimbra Kure, among other battles. In his medieval Futuh Al-Habash documenting this campaign, the chronicler Shihāb al-Dīn indicates that 300 Harti soldiers took part in Imam Ahmad's Adal Sultanate army. He describes them as "famous among the infantry as stolid swordsmen" and "a people not given to yielding"
The Darod clan has produced numerous noble Somali men and women over the centuries, including many Sultans. Traditionally, the Darod population was mostly concentrated in the northern and northeastern cities on the Gulf of Aden and with a presence in Kismayo in addition to the southwestern Gedo region. Outside of Somalia proper, there are various Darod sub-clans in the Ogaden and the North Eastern Province (currently administered by Ethiopia and Kenya, respectively) of upper Indian Ocean coast in the Horn of Africa. Darod noble men ruled these settlement pockets until the European colonial powers changed the political dynamics of Somalia during the late 19th century. Before many Darods began pushing southward in the mid-1850s, the Warsangali Sultanate governed the interior regions of Sanaag and Sool, while the Majeerteen Sultanate and Sultanate of Hobyo held steadfast in solidly established posts from Bosaso to Hobyo. In addition to their traditional strongholds in northern Somalia, Marehan, Ogaden, and Harti Darod members settled further down south and southwest in the Gedo region (a region which was part of Upper Jubba as well as the entire length of the Jubaland region, composed of Gedo, Middle Jubba and Lower Jubba). Several sources, including the Canadian Report of the Somalia Commission of Inquiry, indicate that the Darod is the largest Somali clan. However, other sources such as the CIA and Human Rights Watch indicate that the Hawiye is the largest Somali clan. Dir (Somali: Dir, Arabic: در‎) clan, or Theyr bin Abdalla as mentioned in the book Futuh ul-Habasha. Dir clan members are by tradition believed to be descended from a forefather named Dir. Dir is held to be the great grandson of Ram Nag, an Arab migrant who landed in Zeila on the northwestern Somali coast. However, other accounts maintain that Ram Nag was of Indian, or of Abyssinian extraction. Dir is also reputed to be the uncle of Esa Madoba, the patriarch of the Issa Dir sub-clan, as well as the brother of Hawiya Irrir, who founded the Hawiye clan. In addition, Dir is regarded as the father-in-law of Darod, the progenitor of the Darod clan. According to others, Dir had a fifth son, Qaldho Dir. The Northern Dir consist of the Gadabuursi (Samaroon Siciid), the Issa Madoobe Dir of Djibouti, and the Isaaq. The Southern Dir and Western Dir of Ethiopia number over eleven clans who mostly come from the Madahweyne Dir or Meha Dir. Its members mostly live in northwestern, central and southern of Somalia and Djibouti, in addition to the Somali Region of Ethiopia and the North Eastern Province in Kenya. The Dir in Ethiopia are represented by the Madahweyne Dir. The subclans of the Madahweyne (Madahweyne Dir) include: Gariir, Gurgura clan, Layiile, and Akisho (Gurre). Other Dir clans in Ethiopia are the Issa of Madoobe Dir, Samaroon Siciid (Gadabuursi) of Mandaluug Dir, Garre-Quranyow Maxamed, Gadsan, Fiqi Muhumand, Fiqi Yahye and Fiqi Cumar (Qubeys), Fiqi Khairre (Saleban Abdalle) of Meha Dir and others. Most of the Dir clans in Ethiopia live in the Dire Dawa area, the Jijiga Zone, and along the Awash River. The rest of the Ethiopian Dir clans live in southern parts near the Somali border near Dolo Odo and as far as Guure Dhamoole and Negele Boran where the Garre Quranyow Maxamed Xiniftire subclans of Meha Dir live. Members of the Hawiye clan trace their ancestry to Irir Samaale. Members of the clan primarily live in central and southern Somalia, in the Ogaden and the North Eastern Province (currently administered by Ethiopia and Kenya, respectively), and in smaller numbers in other countries. The Hawiye are either the largest or second-largest Somali clan, but are the dominant clan in Mogadishu, the capital of Somalia. Hawiye clan members are by tradition believed to be descended from a forefather named Hawiya Irrir. Hawiya Irrir is held to be the brother of Dir, himself the great-grandson of Ram Nag, an Arab migrant who landed in Zeila on the northwestern Somali coast. However, other accounts maintain that Ram Nag was of Indian, or of Abyssinian extraction. The Foundations of the Hawiye Group of Clans. This diagram illustrates the hierarchy of the clans founded by Hawiye Irrir Zumali Ram Nag, now known as the Hawiye group of clans. The first written reference to the Hawiye dates back to a 13th-century document by the Arab geographer, Ibn Sa'id, who described Merca at the time as the "capital of Hawiye country". The 12th century cartographer Muhammad al-Idrisi may have referred to the Hawiye as well, as he called Merca the region of the "Hadiye", which Herbert S. Lewis believes is a scribal error for "Hawiye", as do Guilliani, Schleicher and Cerulli. Due to ancient pastoralist migrations and population movements across the Somali peninsula in search of water wells and grazing land over a period of thousand years, Hawiye clans today can be found inhabiting an area stretching from the fertile lands of southern Somalia between Barawa and Kismayo, to the regions surrounding Merka, Mogadishu and Warsheikh in the hinterland, west to the modern city of Beledweyne in the Hiran region, and north to the ancient port town of Hobyo in the arid central Mudug region. 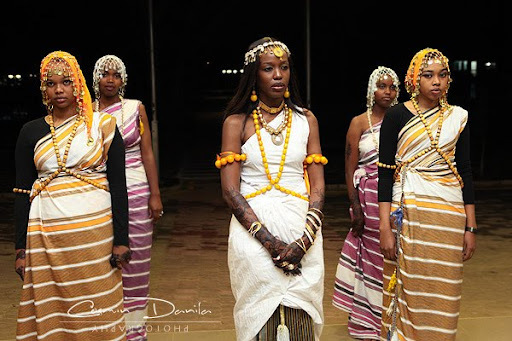 Sub-clans of the Hawiye include the Degodia, about 40 percent of whom live in Ethiopia. When Arthur Donaldson Smith traveled through what is now Bare woreda in 1895, he found that the Degodia were neighbors of the Afgab clan, their territory stretching east to the Weyib and Dawa Rivers. The economy of the Hawiye in the interior includes the predominant nomadic pastoralism, and to some extent, cultivation within agricultural settlements in the riverine area, as well as mercantile commerce along the urban coast. At various points throughout history, trade of modern and ancient commodities by the Hawiye through maritime routes included cattle skin, slaves, ivory and ambergris. The Isaaq (also Isaq, Ishaak) (Somali: Reer Sheik Isaxaaq, Arabic: إسحاق‎) clans. According to early Islamic books and Somali tradition, the Isaaq clan was founded in the 12th or 13th century with the arrival of Shaykh Ishaq ibn Ahmad al-Hashimi from Arabia, a descendant of one of the Prophet Muhammad's early followers. He settled in the coastal town of Maydh in modern-day northernwestern Somalia, where he married into the local Dir clan. Members principally live in the northwestern Somaliland region of Somalia, and the Somali Region of Ethiopia. The populations of five major cities of Somaliland – Hargeisa, Burco, Berbera, Erigavo and Gabiley – are predominantly Isaaq. As of the late 1980s, the Sacad Muuse, Habar Awal and Jibriil Abokor sub-clans of the Isaaq were also the main inhabitants of Gabiley. There are numerous existing hagiologies in Arabic which describe Sheikh Isaaq's travels, works and overall life in northern Somalia, as well as his movements in Arabia before his arrival. Besides historical sources, one of the more recent printed biographies of Sheikh Isaaq is the Amjaad of Sheikh Husseen bin Ahmed Darwiish al-Isaaqi as-Soomaali, which was printed in Aden in 1955. Sheikh Isaaq's tomb is in Maydh, and is the scene of frequent pilgrimages. Sheikh Darod is buried nearby in the ancient town of Haylaan, situated in the Hadaaftimo Mountains. Sheikh Isaaq's mawlid (birthday) is also celebrated every Thursday with a public reading of his manaaqib (a collection of glorious deeds). Although the Isaaq clan claims paternal descent from Sheikh Isaaq, group members are often recognized as a sub-clan of the Dir. In the Isaaq clan-family, component clans are divided into two uterine divisions, as shown in the genealogy. The first division is between those lineages descended from sons of Sheikh Isaaq by an Ethiopian woman – the Habar Habuusheed – and those descended from sons of Sheikh Isaaq by a woman of the Magaadle clan – the Habar Magaadle. Indeed most of the largest clans of the clan-family are in fact uterine alliances. 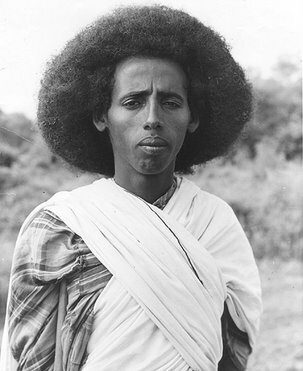 The Rahanweyn (Somali Maay: Reewing; traditional Somali: Raxanweyn, Arabic: رحنوين‎) clan. It is composed of two major sub-clans, the Digil and the Mirifle. It makes up about 20% of the population of Somalia, and is one of the five major Somali clans residing in the Horn of Africa. The Digil sub-clan mainly consists of farmers and coastal people, while the Mirifle are predominantly nomadic pastoralists. According to the Rahanweyn, Somalis are linguistically grouped into Mai Terreh and Maxaa Tiri. The speakers of Mai Terreh (also known as Mai-Mai or Af-Maay) are the Rahanweyn, while the speakers of Maxaa Tiri (i.e. Standard Somali) belong to other clans (Darod, Dir, Hawiye and Isaaq). The Digil and Mirifle are mainly concentrated in southern Somalia, including Mogadishu, Upper Juba (Gedo, Bay, Bakool, most parts of Jubbada Dhexe) and Shabeellaha Hoose. They are also found in the Somali Region of Ethiopia and the North Eastern Province of Kenya. Among the nomads, wealthier men were traditionally those who owned more camels and other livestock. Warriors and priests were considered to have the most prestigious vocations. 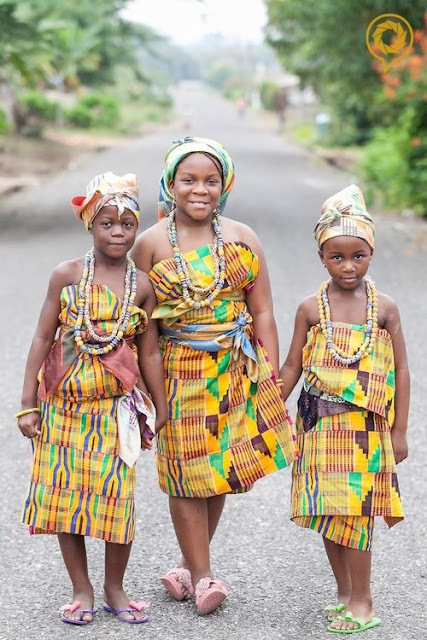 In some Rahanwayn and Digil settlements, members are divided between Darkskins and Lightskins, with those of darker skins having slightly more prestige in ceremonies, although the two are considered equal in other ways. Marriage. Somali marriages have traditionally been considered a bond between not just a man and a woman but also between clans and families. Until very recently, most Somali marriages were arranged, usually between an older man with some wealth and the father of a young woman he wished to wed. These customs still hold true in many rural areas in the twenty-first century. The man pays a bride price—usually in livestock or money—to the woman's family. Samaal traditionally marry outside their family lineage, or, if within the lineage, separated from the man by six or more generations. Saab follow the Arab tradition of marrying within the father's family lineage, with first cousins often marrying. A Somali bride often lives with her husband's family after marriage, with her own parents providing the home and household goods. She keeps her family name, however. Weddings are joyous occasions, but the couple often signs an agreement giving the bride a certain amount of property should the couple divorce, which is common in Somalia. The husband holds the property in trust for her. Tradition calls for the wife to relinquish her right to the property if she initiates the divorce. 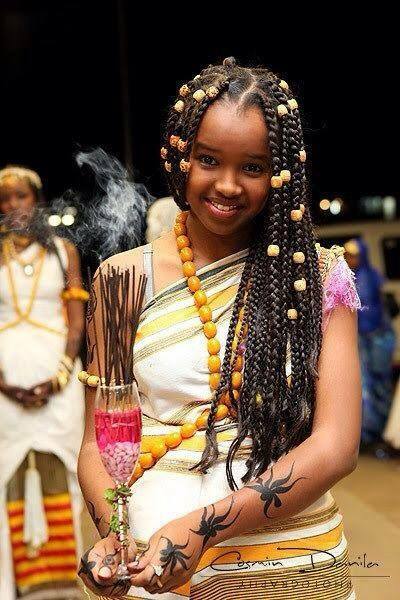 Beautiful Somali girl at a wedding. She wears the traditional Somali dress called a “guntiino” as well as amber across her torso and in her hair. Her arms, adorned with henna, carry incense. Amber has importance in Somali culture and is typically worn by females. As one of three nations in the world to which frankincense and myrrh grows on plants native to the country (rather than being an introduced plant), incense in its various forms has great importance in Somali culture – particularly in Somali homes and in ceremonies, as does henna. Islamic law permits a man to have up to four wives if he can provide them and their children with equal support. If a man repeats three times to his wife, "I divorce you," the couple is considered divorced. The wife is given a three-month grace period, however, in case she should be pregnant. Today many urban Somalis choose a mate based on love and common interests rather than accepting an arranged marriage. The Somali domestic unit consists of a man, his wife or wives, and their children. Elderly or unmarried relatives may live with the family. In homes with more than one wife, each wife usually lives with her children in her own house, and the husband and father divides his time among them. In the case of a divorce, children usually remain with their mother. The male is considered the head of the household, except where it is headed by a divorced or widowed woman. Inheritance passes from father to son in Somali families. A wife remains a part of her father's lineage, while her children belong to her husband's lineage. Under Islamic law, daughters are entitled to inherit half of what sons get, but in Somali society daughters usually did not receive valuable animals or land. Under Siad Barre's regime, social reforms included equal inheritance rights for women, although this was opposed by some Islamic leaders. Somali society is based on a clan-family structure. The two major clan groups are the Samaal (or Samale) and the Saab (or Sab), named for two brothers who are said to have been members of the prophet Muhammad's tribe, the Quraysh of Arabia. Many Somalis believe that their ancestor from Old Testament times was Noah's son Ham. 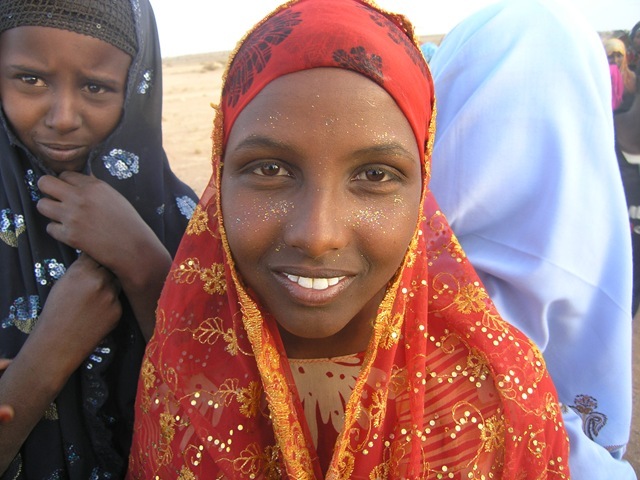 The Samaal, which make up about three-quarters of the Somali population, are divided into four main clan-families: the Dir, Daarood, Isaaq, and Hawiye. The Saab are divided into the Digil and Rahanwayn clan-families. Major clans can have thousands of members, each claiming descent from a common ancestor. These clans are subdivided into subclans and into primary lineage groups. Somali men trace their membership in a particular clan-family through their patrilineage, going back a dozen or more generations. Clan groups with the longest ancestry have the most prestige. Clans and subclans are associated with the territory they occupy for most of the year. Child Rearing and Education. Somali children are raised with much love but are also disciplined and taught to work from age five or six, with little time for play. In spite of numerous hardships, Somali children are known for their sense of joy and abundant laughter. Children are taught independence and self-reliance and to carefully observe the world around them. Both boys and girls are circumcised during a ceremony and celebration. Boys and girls are kept separated, according to Islamic law, and traditionally do not date, although a group of teenage males do a courtship dance for girls of marriageable age. 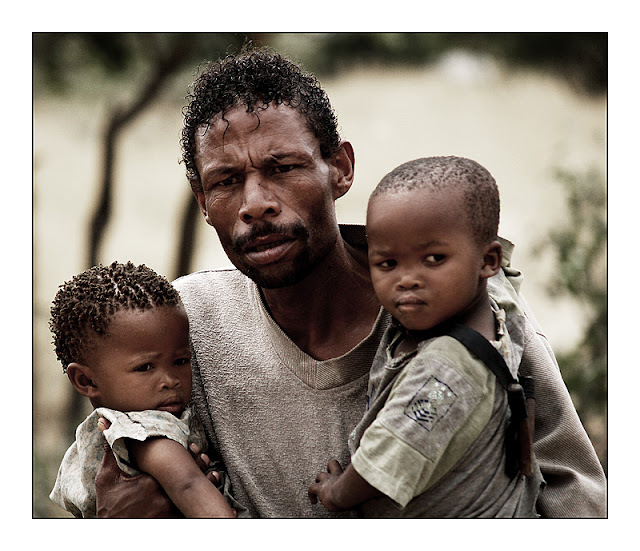 Because of the high incidence of divorce, many children grow up with only one parent, usually the mother, although boys may stay with their father and his wives. Multiple wives make for family groups with many children. Education for Somali children in all but the wealthiest urban families was practically nonexistent, except for training in reading the Qur'an, before the early 1970s. Boys in rural areas attended outdoor schools where they learned Arabic using wooden slates. Before independence some attended Roman Catholic schools, where they learned Arabic or Italian. Under Siad Barre, a Latin-based alphabet was created for the Somali language, which previously had no written form. The leader undertook a massive literacy campaign in Somalia and achieved some success, although many nomadic children still did not attend school, and many others, especially girls, dropped out after four years of primary school. Students learned reading, writing, and arithmetic as well as Arabic, animal husbandry, and agriculture. A lack of trained teachers, materials, and schools, however, made secondary-school classes inadequate, and only about 10 percent of students went on to secondary school. When civil war broke out, most secular education stopped, as schools were bombed and the government, which had hired teachers, collapsed. However, some dedicated teachers struggled on during the 1990s, often without pay. Students continued to come, eager to learn even when there were no chairs or desks and no roof on the school. In the absence of a government, parents contributed what they could toward supplies so their children could continue to get an education. Higher Education. Somali National University in Mogadishu, founded in 1970, was the nation's principal university before the civil war. Courses were offered in education, sciences, law, medicine, engineering, geology, economics, agriculture, and veterinary science. The National Adult Education Center was established in the late 1970s to combat a relapse in literacy among the adult nomadic population. In 1981 the Nomad Education Program was created by the Barre government, which established boarding schools in ten regions and selected students from various clan-families to attend school for sixty days. Students ranged in age from fourteen to fifty, but most were in their twenties. After completing the course, they went home and taught what they had learned to other members of the clan-family. The most relevant courses for the nomad students were those related to geography and the environment. Other valuable classes were those in personal hygiene, nutrition, first aid, and midwifery for female students. The Nomad Education Program, like so many others, died during the civil war. Somali National University was largely destroyed in the fighting in Mogadishu. University professors and Somali intellectuals began working in 1993 to establish a private university in Mogadishu. The new Mogadishu University was finally opened in September 1997. It offers programs in Shari'a and Law, Education, Arts, Business and Economics, and Computer Science. Somaliland also opened a private university, Amoud University, in 1997. It is largely supported by international funding and by Somalis living in the United Arab Emirates. With few exceptions, Somalis are entirely Muslims, the majority belonging to the Sunni branch of Islam and the Shafi`i school of Islamic jurisprudence, although some are also adherents of the Shia Muslim denomination. Sufism, the mystical dimension of Islam, is also well-established, with many local jama'a (zawiya) or congregations of the various tariiqa or Sufi orders. The constitution of Somalia likewise defines Islam as the religion of the Somali Republic, and Islamic Sharia as the basic source for national legislation. Islam entered the region very early on, as a group of persecuted Muslims had, at Prophet Muhummad's urging, sought refuge across the Red Sea in the Horn of Africa. Islam may thus have been introduced into Somalia well before the faith even took root in its place of origin. Although Somalian women were initially excluded from the many male-dominated religious orders, the all-female institution Abay Siti was formed in the late 19th century, incorporating Somali tradition and Islam. In addition, the Somali community has produced numerous important Islamic figures over the centuries, many of whom have significantly shaped the course of Muslim learning and practice in the Horn of Africa, the Arabian Peninsula, and well beyond. Among these Islamic scholars is the 14th century Somali theologian and jurist Uthman bin Ali Zayla'i of Zeila, who wrote the single most authoritative text on the Hanafi school of Islam, consisting of four volumes known as the Tabayin al-Haqa’iq li Sharh Kanz al-Daqa’iq. Christianity is a minority religion in Somalia, with over 1,000 practitioners. Religious Practitioners. Unlike other Muslims, Somalis believe that both their religious and secular leaders have the power to bless and to curse people. This power, believed to be given by Allah, is called baraka . Baraka is believed to linger at the tombs of Somali saints and to help cure illness and resolve other troubles upon a visit to the tomb. Islamic teachers and mosque officials make up a large portion of religious practitioners (Islam has no priests). Somali followers of Sufiism, given the name Dervishes, dedicate themselves to a life of religion by preaching Islam and giving up all possessions. The Sufi are also known for the farming communities and religious centers they established in southern Somalia, called jamaat. Among nomads, a respected male leader or religious devotee might be appointed wadad. His duties are to lead prayers and to perform ritual sacrifices on religious holidays and special occasions. He also learns folk astronomy, which is used for healing, divination, and to determine times for migration. Other religious practitioners include the Yibir clan of the Saab. Yibir practitioners are called on to exorcise spirits and restore health, good fortune, or prosperity to individuals through prayers and ceremonies, including animal sacrifice. Rituals and Holy Places. Mosques can be found in all Somali cities and towns. Nomads worship wherever they are, with men and women praying and studying the Qur'an separately. In accordance with Islam, Somalis are to pray five times each day, facing Mecca. They should recite the creed of Islam and observe zakat, or giving to the poor, if able. They should make a pilgrimage to Mecca at least once and should observe the fast of Ramadan. Tombs of the Somali holy men or sheiks, venerated as saints, have become national shrines. Pilgrims visit on the saint's annual feast day, usually in the month of his birth, when his power is believed to be the strongest. Religious holidays include the Islamic holidays of Ramadan (the month of fasting); Id al-Fitr (the Little Feast); the First of Muharram (when an angel is said to shake the tree of life and death); Maulid an-Nabi (the birth of the prophet Muhammad); and Id al-Adha (commemorating the story of Abraham and his son Ishmael). Islamic holidays fall at different times of year according to the Islamic calendar. Holidays are celebrated with feasting and storytelling, visiting graves, giving to the poor, parades, plays, and ceremonies. Somali cuisine varies from region to region and consists of a fusion of diverse culinary influences. It is the product of Somalia's rich tradition of trade and commerce. Despite the variety, there remains one thing that unites the various regional cuisines: all food is served halal. There are therefore no pork dishes, alcohol is not served, nothing that died on its own is eaten, and no blood is incorporated. Qado or lunch is often elaborate. Varieties of bariis (rice), the most popular probably being basmati, usually serve as the main dish. Spices like cumin, cardamom, cloves, cinnamon and sage are used to aromatize these different rice delicacies. Somalis eat dinner as late as 9 pm. During Ramadan, supper is often served after Tarawih prayers; sometimes as late as 11 pm. Xalwo (halva) is a popular confection eaten during festive occasions, such as Eid celebrations or wedding receptions. It is made from sugar, corn starch, cardamom powder, nutmeg powder and ghee. Peanuts are also sometimes added to enhance texture and flavor. After meals, homes are traditionally perfumed using frankincense (lubaan) or incense (cuunsi), which is prepared inside an incense burner referred to as a dabqaad. Somali art is the artistic culture of the Somali people, both historic and contemporary. These include artistic traditions in pottery, music, architecture, wood carving and other genres. Somali art is characterized by its aniconism, partly as a result of the vestigial influence of the pre-Islamic mythology of the Somalis coupled with their ubiquitous Muslim beliefs. However, there have been instances in the past of artistic depictions representing living creatures such as the golden birds on the Mogadishan canopies, the camels and horses on the ancient rock paintings in northern Somalia, and the plant decorations on religious tombs in southern Somalia, but these are considered rare. Instead, intricate patterns and geometric designs, bold colors and monumental architecture were the norm. Additionally, henna is an important part of Somali culture. It is worn by Somali women on their hands, arms, feet and neck during weddings, Eid, Ramadan, and other festive occasions. Somali henna designs are similar to those in the Arabian peninsula, often featuring flower motifs and triangular shapes. The palm is also frequently decorated with a dot of henna and the fingertips are dipped in the dye. Henna parties are usually held before the wedding ceremony takes place. Somalia has long been known as a nation of poets. A people with few possessions and no written language until the 1970s, Somalis developed an oral tradition of poetry and storytelling, that has been passed down through generations. Many of these poems and stories were written down in the late twentieth century. A popular new genre of song on the radio in the late twentieth century was heello, taken from Somali poetry. Some themes of Somali poetry are history, philosophy, and clan politics, as well as praise or ridicule of humans or animals. Probably the best-known Somali poet is spiritual and military leader Muhammad Abdullah Hasań, leader of the Muslim Dervishes. Islamic poetry is also a Somali tradition; many poets were great religious leaders and are now considered saints. Somali Islamic poetry is written in Arabic, often in the form of prayer. Although Somali poets have been writing since at least the twelfth century, the most well-known Somali Islamic poets of recent times are Seylici (d. 1882), "Sheik Suufi" (d. 1905), and Sheik Uweys Maxamed (1869–1905). Somali Islamic prose written in Arabic is called manqabah. Writers record the deeds and virtues of Somali sheiks, or religious leaders, some with miraculous powers. Somalis also read Arabic religious classics. Modern Somali novelist Nuruddin Farah (b. 1945) has become internationally famous for his novels about African women's issues and the struggle for human rights in postcolonial Africa. His novels include From a Crooked Rib (1970), Maps (1986), and Gifts (1992). He was awarded the Neustadt International Prize for Literature in 1998. Men: When not dressed in Westernized clothing such as jeans and t-shirts, Somali men typically wear the macawis (ma'awiis), which is a sarong-like garment worn around the waist. On their heads, they often wrap a colorful turban or wear the koofiyad, an embroidered taqiyah. Somali men wearing traditional attire. Somali men, especially elders, will wear a go' (a big sort of shawl). Due to Somalia's proximity to and close ties with the Arabian Peninsula, many Somali men also wear the khamis (kamis in Somali), a long white garment common in the Arab world. Women: During regular, day-to-day activities, women in Somalia usually wear the guntiino, a long stretch of cloth tied over the shoulder and draped around the waist. The guntiino is traditionally made out of plain white fabric sometimes featuring with decorative borders, although nowadays alindi, a textile common in the Horn of Africa region and some parts of North Africa, is more frequently used. The garment can be worn in many different styles and with different fabrics. For more formal settings such as weddings or religious celebrations like Eid, women wear the dirac, a long, light, diaphanous voile dress made of cotton, polyester or saree fabric. The dirac is related to the short-sleeved Arabian kaftan dress. It is worn over a full-length half-slip and a brassiere. Known as the gorgorad, the underskirt is made out of silk and serves as a key part of the overall outfit. The dirac is usually sparkly and very colorful, the most popular styles being those with guilded borders or threads. The fabric is typically acquired from Somali clothing stores in tandem with the gorgorad. In the past, dirac fabric was also frequently purchased from South Asian merchandisers. Married women tend to sport head-scarves referred to as shash, and also often cover their upper body with a shawl known as garbasaar. Unmarried or young women, however, do not always cover their heads. Traditional Arabian garb such as the jilbab is also commonly worn. 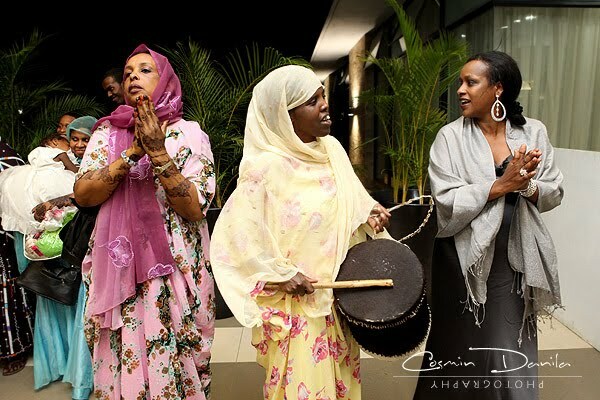 Additionally, Somali women have a long tradition of wearing gold and silver jewelry, particularly bangles. During weddings, the bride is frequently adorned in gold. Many Somali women by tradition also wear gold necklaces and anklets. Xirsi, a quranic necklace, also worn in countries such as Ethiopia and Yemen, is also frequently worn. Henna is another important part of Somali culture. It is worn by Somali women on their hands, arms, feet and neck during weddings, Eid, Ramadan, and other festive occasions. Somali henna designs are similar to those in the Arabian peninsula, often featuring flower motifs and triangular shapes. The palm is also frequently decorated with a dot of henna and the fingertips are dipped in the dye. Henna parties are usually held before the wedding ceremony takes place. Somalis use sweeping hand and arm gestures to dramatize speech. A swift twist of the open hand means "nothing" or "no". Snapping fingers may mean "long ago" or and "so on"
A thumb under the chin indicates "fullness". It is impolite to point the sole of one's foot or shoe at another person. It is impolite to use the index finger to call somebody; that gesture is used for calling dogs. The American "thumbs up" is considered obscene by the majority of Somalis. Somalis hold the Muslim view that each person will be judged by Allah in the afterlife. They also believe that a tree representing all Muslims grows at the boundary between Earth and Heaven (some believe the boundary is on the Moon). Each person is represented by a leaf on the tree. When an angel shakes the tree on the first day of the new year, in the Islamic month of Muharram, it is said that those whose leaves fall off will die within the coming year. Muslims also believe that a person who dies while fasting during Ramadan is especially blessed by Allah. When a Somali dies, feasting and celebration are held, as they are at a birth. A Somali wife must mourn her husband's death in seclusion at home for four months and ten days, according to Islamic practice. Meet Arawelo, the legendary Somali Queen who stood toe to toe with Somali men. Arawelo was such a fierce woman that she organized a band of warrior women and ruled an area of Somalia. Although her reign was short-lived, her bravery and skill have remained long after in Somali folklore. The picture is a representation of the independent spirit of Arawelo but to learn more, check out this page. Be Inspired! Be Positive! Be Somali! 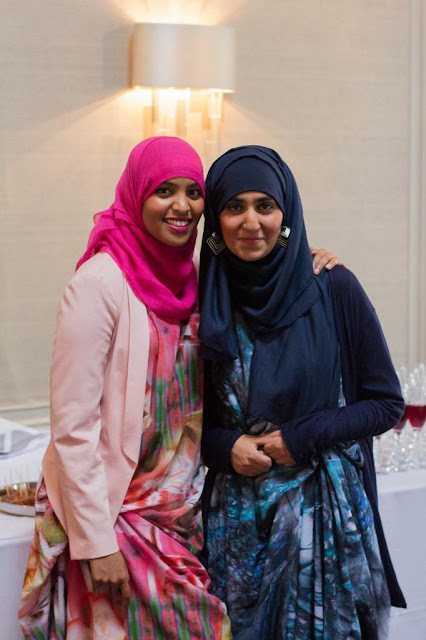 "Dr. Hawa Abdi studied medicine in Ukraine before returning home to become one of 1st female gynecologists in Somalia. Also graduated from law school at Somali National University & opened a 1-room clinic that later became the Hawa Abdi hospital/camp. Here, some 100,000 Somalis receive food and medical care—no matter what their clan. "They have mixed over the years with Arab settlers"? Please drop this line. On one hand you appear to want to highlight the ancientness of the Somalis, but on the other hand you ruin all of that with just that one sentence, right at the beginning! How can you be ancient, if you were mixed yesterday? The fact is, the Arabs that came were few shiekhs whose purpose was to teach Islam. They travelled to and settled similarly in all other places where Islam is now the dominant religion.They were never large enough to make an impact on our DNA (as studies show!). You have no more Arab DNA than a Northern European man has. I am a light skinned Somali, I often get people assuming this is attributed to Arab DNA. But guess what, nothing about my features resembles an Arab's. On average, I stand at least 5 inches above the average Arab woman, and there isn't much resemblance to an Arab face. I do believe 100% we have a lot in common with the ancient Berbers and Egyptians, but modern day Arabs, NO. And I think our exchanges with those cultures took place thousands of years ago, as the Egyptian history shows. You will not hear our Ethiopian and Eritrean sisters and brothers talk of Arab mix - why do Somalis have this sad need to beg Arab-ness?? I'm sorry, I didn't read much of this blog. Just quickly scrolled through the images... Too many qasil faces - that may not be highlight their beauty. Good effort, but be proud in your own uniqueness. Beautiful said, mix is not the case before the Arabs went into Africa we always look the way we did, we are Africans lets be proud of it. And your guntiinos and diracs are messed up. And ALL women, regardless of whether they are married or not wear full covering now. Even little girls. This has been the case since the civil war, prior to that women had more choices. I only read about 10% of this blog - and too many inaccurate information is what I'm seeing. Somalis in the West now trying to be something else. There were no Somalis in the Horn before the Arabs. Every single Somali tribe descents from a pre or post-Islamic Arab tribe. Somalis in the Horn and the rest of the Arab world would laugh at you jokes. Kush was a Nilotic empire that was situated in todays Sudan, the spoke Nilo-Saharan and were ethnically completely different from Somalis or any Horner. Their descendants today are the Nubians, the Nuba, Dinka, Nuer etc. Isaaq is a subclan of dir. they are not descendent of an Arab sheikh. Isaaq lineage is isaaq mahamed haniftire maha dir aji irir samaale. Please delete the part where you say isaaq is Arab.